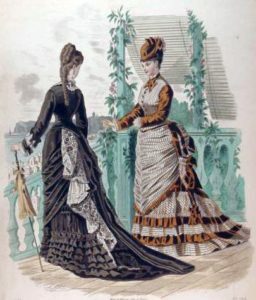 Starting 1860s ‘Hoop Skirts’ started losing popularity. It gave way to the Early Bustle. How were the Early Bustle Dresses worn? The Early Bustle rocked the fashion scene in Victorian Times. The overall shape was full in the front, much like the hoop skirt. However, the back now had more of fabric added to it. This gave it a long look and back touching the floor. This form became very famous as Bustle Wedding Dresses. The Victorian Wedding Bustle Dresses were a result of this early bustle gowns and dresses. Moving to the early 1860’s we come to the Early Bustle Gowns. Early Bustle Dresses can be characterized mostly during the 1870s where the skirt shape was long on the backside. The back was mainly in focus. It remained full at the sides, very, much like the Fashion Plates. Sleeves became narrower to the wrist. The two-piece sleeve coat was found in every Bustle Gown. The Gowns were worn with layers and layers of inner petticoats so that the gowns and long backs could be avoided from dirt. Dust Ruffles were added to the inside of the trail. Lightweight fabrics were much more popular as they were easy to carry and maintain. Ladies wore rich and lightweight fabrics for evening parties and ceremonies. The necklines were made in V shapes. For day wear, the necklines were high. They could be with or without collars. They could be square or heart-shaped. For evenings, the necklines could be low and plunging, revealing the cleavage. This gave the Early Bustle an attractive and sensuous appeal. The Early Bustle was characterized by intricate designs and very lavish fabric. They were worn by the fashionistas of the time. For some time, there were small pockets made at the back of the dress. Though they were not practical as they were on the back, they looked interesting and stylish. This style was shortlived and remained only for a year. It was done away with by being ridiculed as “boon to pickpockets”. Evening sleeves were very stylish and interesting. The embellishments on the gown were expensive and intricately done. The sleeves of the Bustle Gowns were small and they were embellished with puffs, ruffles, bows and were made in contrasting colors. 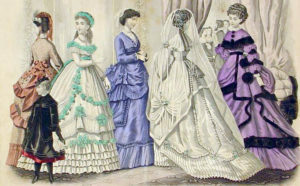 Early Bustle-Women wearing evening dresses, Madame Fladry designs, September 17, 1876. The dresses were trained and the walking bustle gowns were floor length. 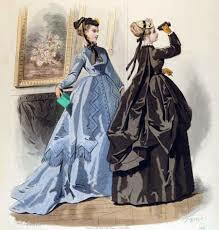 The ladies chose to wear the Bustle Gowns in the evening parties and balls. The long tailback of the Bustle Dresses looked really beautiful and attractive. This gave the dress a feminine feel and became the Early Bustle Wedding Types. 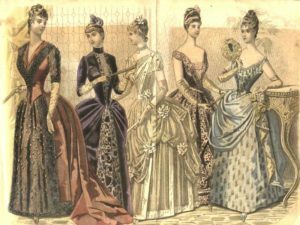 Early Bustle Dresses took the Victorian Fashion by storm. They were worn during dinner parties, balls and evening parties. 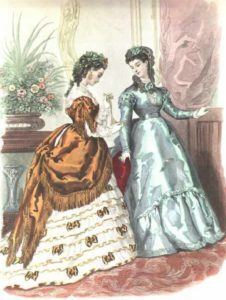 Early Bustle In 1860s and 1870s were all bout pretty dainty colorful gowns with long floor touching backs. 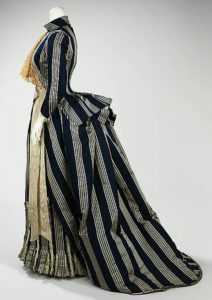 During the 1870s, the excess fabric remained but the dress size began to dwindle and come down. A vertical line which could be seen in the trimmings. They were clear cut patterns and very neatly cut. One example is the Cinderella Dress – The Early Bustle. The best part about Early Dresses was that they were high luxurious made in silk and satins. French Early Bustle Wedding Gowns also became popular. 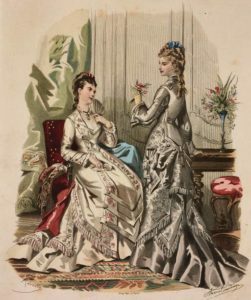 They came to be known as Victorian Ball-in Gowns.